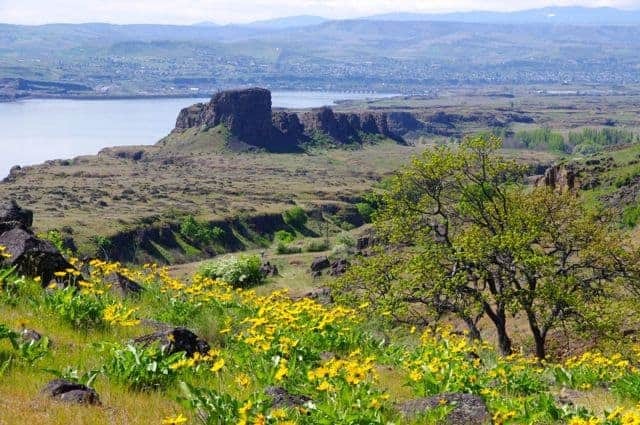 Each year, a magical thing happens for Portland-area hikers: while we are still soaked with rain, the eastern Columbia River Gorge is bathed in sunshine, and awash in wildflowers. April and May are the prime flower seasons, but what are the best wildflower hikes in the Gorge? Well, here is one list, from your humble guidebook author. They are arranged from east to west, to track their prime bloom times. 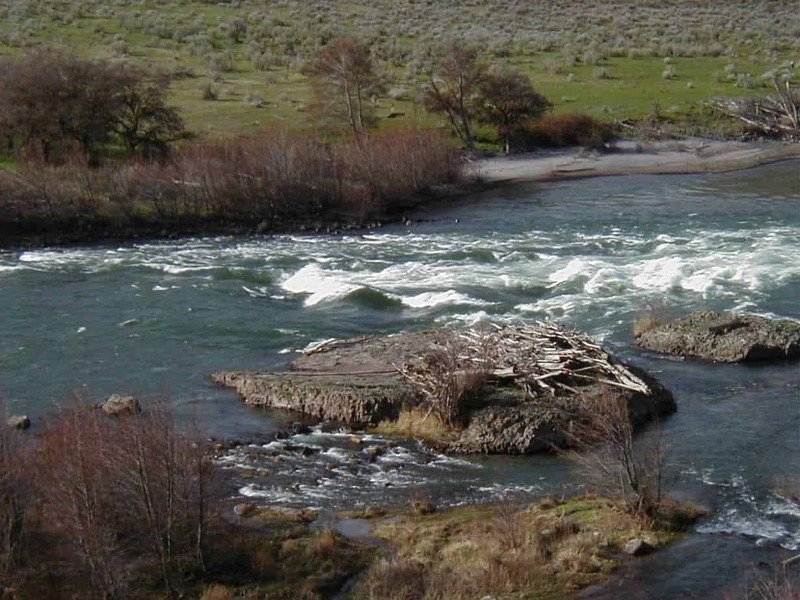 Start: At Deschutes River State Recreation Area, east of The Dalles on I-84. Distance: Up to 22.6 miles roundtrip. Elevation Gain: 400. Peak flower time: Early-mid April. 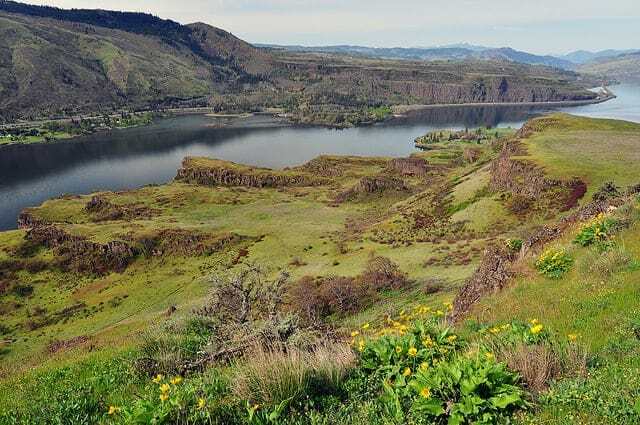 Usually the first of these hikes where flowers show up in the springtime, because it’s the lowest and farthest east, the Deschutes is a year-round getaway to another world. Even in the Hood River area, you can feel like you’re basically in the Cascades or the western Gorge. Out here, though, there’s no doubt: you’re getting into desert country. The first couple of miles are all in the state park, with a side trip from the main road up to Ferry Springs about a mile out; it comes back down to the main trail at the two-mile mark. There is also a hiker-only trail down by the river that makes a nice loop opportunity. Starting a few miles up, there are even campsites with outhouses, so this is a good one to consider for an easy overnighter. 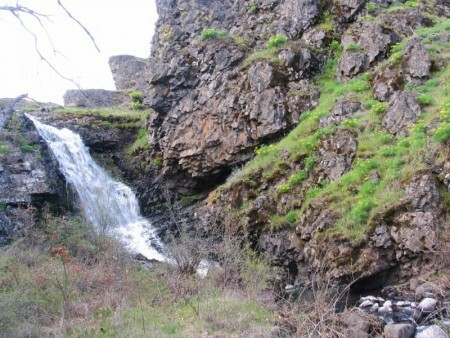 Start: At Crawford Oaks Trailhead, 3.7 miles east of The Dalles Bridge on the Washington side, in Columbia Hills Historical State Park. Distance: This loop is 6.9 miles. Elevation Gain: 1,060′. Take note: Washington Discover Pass required. Peak flower time: Mid-April to May. There are many loops available in this state park, which are covered in the Oregon Hikers link above. 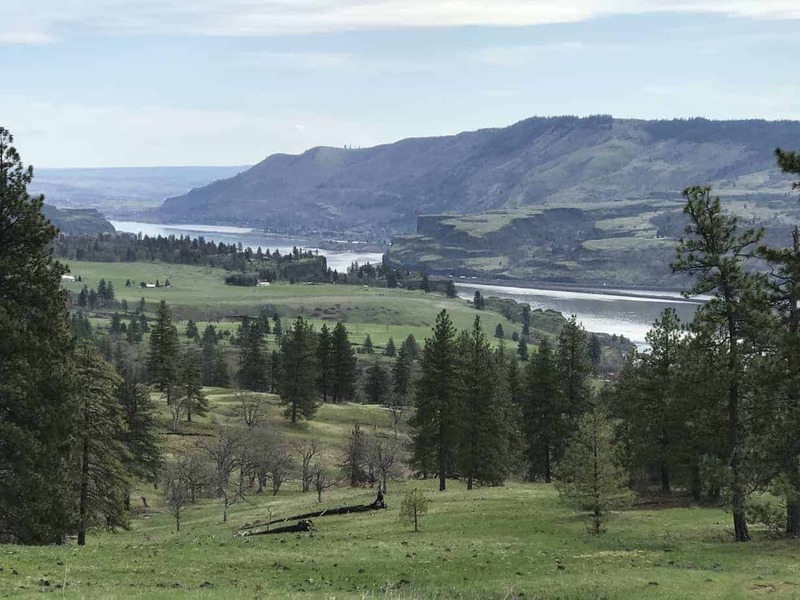 The bottom line, though, is this: It’s a large, open, hilly area with panoramic views of the Columbia River, Mounts Hood and Adams, and fascinating rock features. 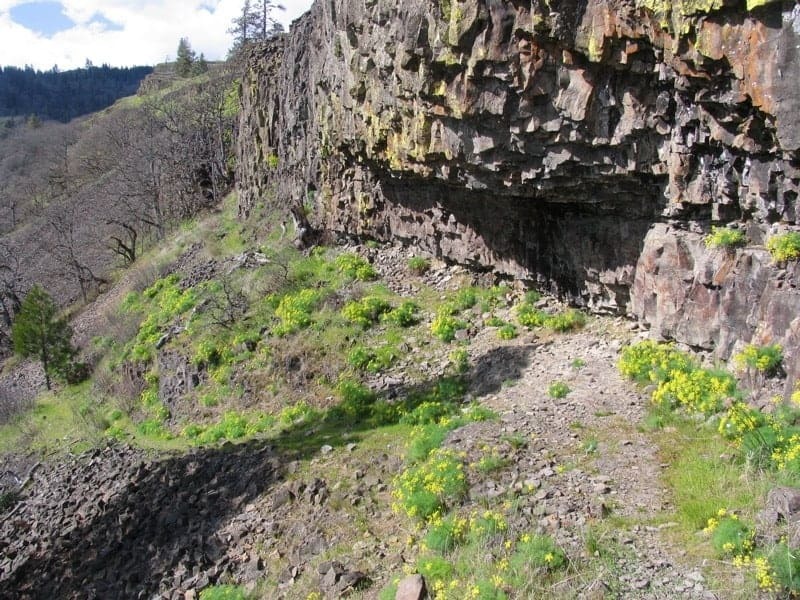 And it is possibly the great flower show in the Gorge. 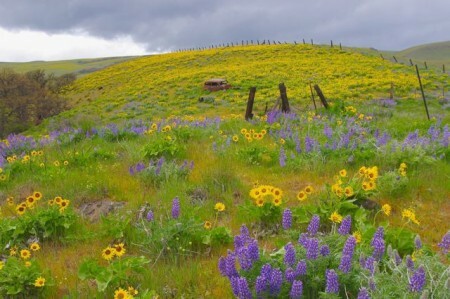 When the lupines and balsamroot are out here, usually early May, it is truly something to see. But it isn’t just flowers; there are also historic structures, interesting wildlife, roads from the 1850s … all sorts of things to entertain and amaze. For you rock climbers, Horsethief Butte is also in this park. And there is a riverside campground, as well. Start: Just past the tunnels east of Lyle, Washington, on WA Highway 14. Distance: 4.2 miles. Elevation Gain: 1,160. 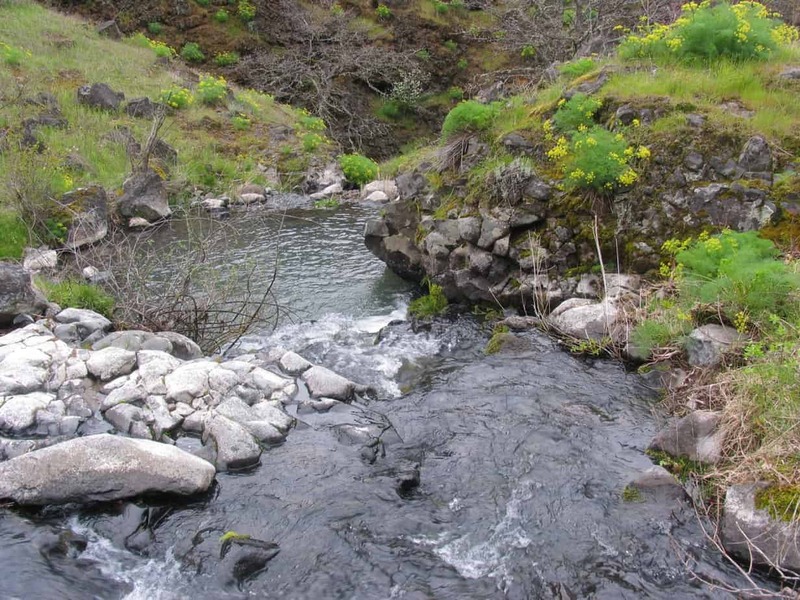 Take note: Poison oak and ticks are around, and a (free) waiver is required to hike. Peak flower time: Mid-late April. This, I think, is going to be one of the next big trails in the Gorge. In terms of being discovered and developed, it is right where Coyote Wall/Labyrinth and Cape Horn were, say, 5 years ago. It’s actually on private land (hence the waiver), but Friends of the Gorge is working on access from the town of Lyle, and I am convinced some day this will be a massively popular hike. The thing is, it requires some effort. From the trailhead, you switchback up through a narrow canyon before emerging on a wonderful plateau filled with flowers from March to May. You can just wander around up here and call it a day, but it’s worth it to climb some more up the ridge face, then meander through oak forest with great views, eventually popping out at the meadow where once stood a cherry orchard. Now there’s one scraggly, tough, and very old cherry tree, barely alive. But the view is all the way to The Dalles, and it’s a mighty fine place for lunch. Flowers and open views are what it’s all about at McCall Preserve. Start: At Rowena Crest Viewpoint, 6.5 miles east of Mosier on Oregon Highway 30. Distance: 2-3 miles. Elevation Gain: Very little on the plateau, 1,000 feet to McCall Point. 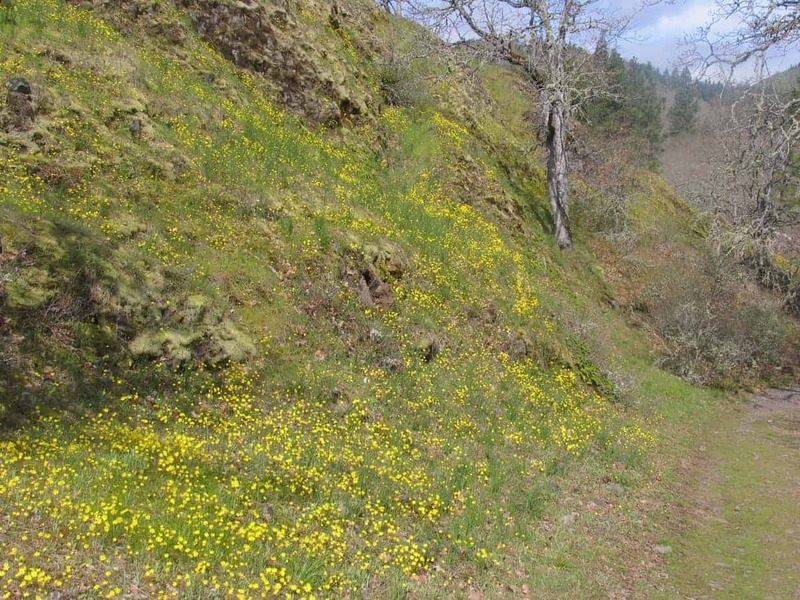 Take note: Poison oak and ticks are around; McCall Point Trail opens May 1. Also some cliffs to watch out for. And no dogs allowed here. Peak flower time: Mid April to early May. Even the McCall Point trailhead is spectacular! 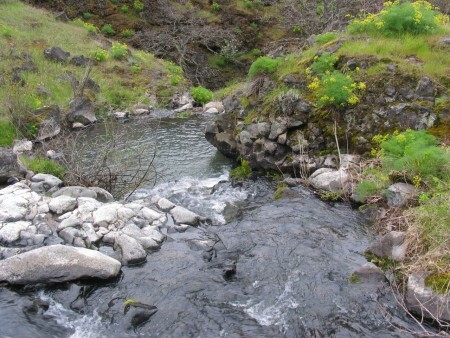 This is a great one if you are hiking with kids; it’s short, easy, scenic, and flower-filled. Just keep an eye on your kids when (if) you get close to the clifftops. 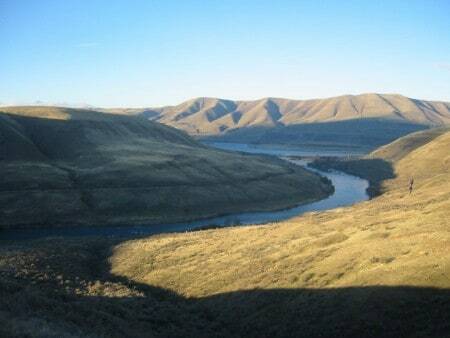 The Plateau Loop is a 2-mile wander that leaves across from the parking lot and heads down toward the river. The trail circles two ponds where you can look for ducks and other birds, and off to the right there are great views of the Columbia and the town of Lyle across the way. The McCall Point Trail goes up from the lot and stays mellow for a while as it follows an old road, then reaches the ridge and turns more sharply uphill. It can also get slippery if it’s rained recently. From the top, you can see Mount Hood and Adams (both about 35 miles away) as well as Mount Defiance, the highest point in the Gorge and one of my top 10 conditioning hikes in the Gorge. Start: At Catherine Creek Trailhead, about 8 miles east of the Hood River Bridge on Old Highway 8 in Washington. Distance: Up to 2.5 miles. Elevation Gain: Maybe 700’. Take note: Ticks and poison oak, plus massive weekend crowds. Peak flower time: April to early May. This wall of yellow greets you within minutes on the Catherine Creek Trail. 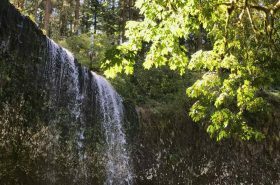 For a basic introduction to the three hikes here, check out my post on 10 Great Hikes for Kids in the Gorge. 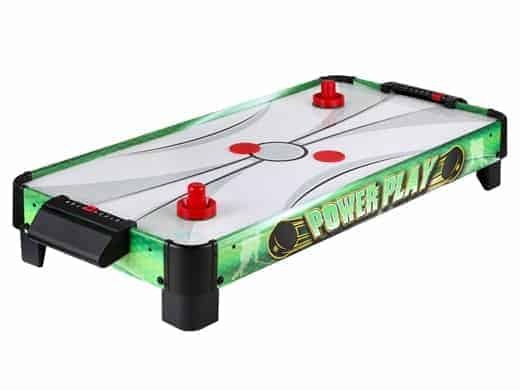 For our purposes here, let’s put in a little more effort. 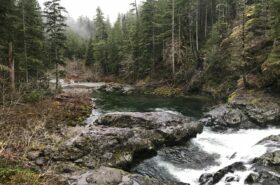 The best hike here, for my money, is to head right from the trailhead, eventually crossing Catherine Creek on a bouncy plank bridge just below the old corral. From there, stay right under the powerlines and keep going up the draw, eventually popping out into the meadows. Then cut east through the meadows or look for another trail heading up to the treeline. When you get up there, you’ve gone 2 miles and gained about 1,100 feet. To keep going, cut through the forest, look for a tiny pond with a huge view, and continue cross-country back to Catherine Creek and follow a user trail back to the corral. There are flowers pretty much everywhere! This area has, over the last couple of years, actually had real trails put in, with signs and everything! 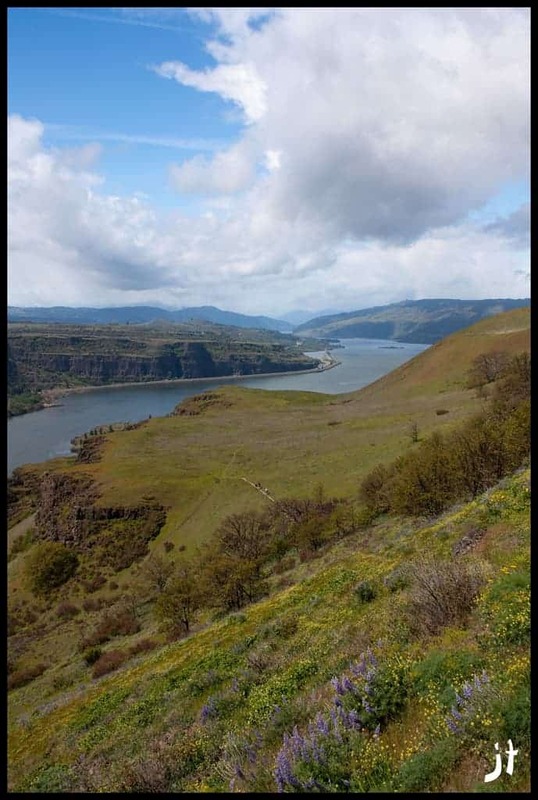 And to top it off, Green Trails Maps has a terrific map that includes all of them: Eastern Columbia Gorge. 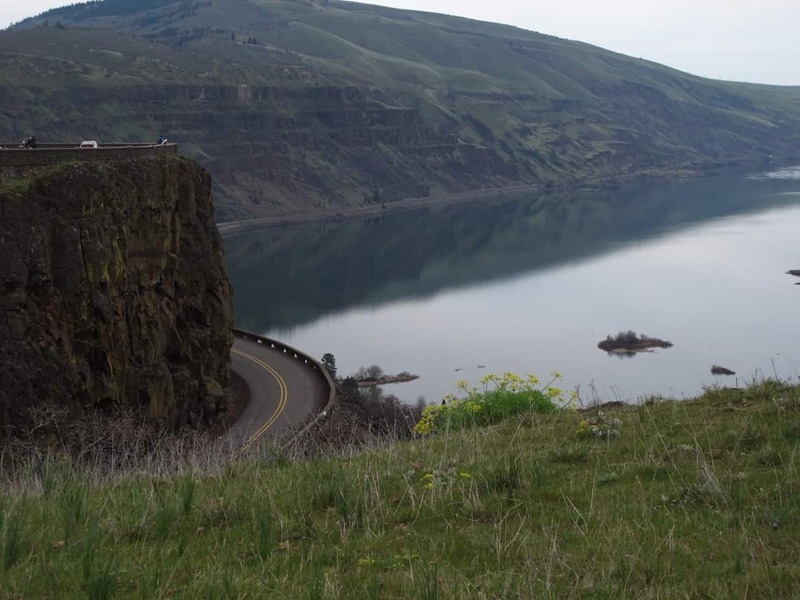 Yes, there’s also a Western Columbia Gorge, and both are recommended. Who wants to hike to Mount Everest Base Camp? The labyrinth is filled with scenes like this. Start: About 5 miles east of the Hood River Bridge, at the intersection of WA 14 and Old Highway 8. Distance: 2 miles. Elevation Gain: Maybe 570’. Take Note: Ticks and poison oak. Peak flower time: Mid April to early May. 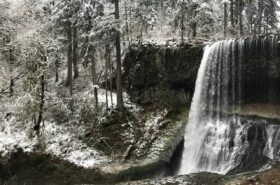 More from oregonhikers.org; the tougher hike is in my book, 60 Hikes Within 60 Miles of Portland. My favorite loop here is a 5.2-miler that goes to the top of the wall and then down through the Labyrinth. It gets a little hard to follow trails in here, as many have been closed and few signed, but the best flower action is up high along the wall and down in the lower parts of the Labyrinth. From the fancy new trailhead, walk up the closed paved road and onto the trails, then stay left to eventually ascend along the top of the wall. Go all the way up for the view, then head back down and look for a trail headed east, near a fence. Don’t go east from the top of the wall, as that’s private property. Once down into the Labyrinth, go it’s nothing but flowers, waterfalls, trees, meadows, and viewpoints. Oh, and a cave of sorts. The Labyrinth varies from an alpine feel to a secret garden vibe. Like Catherine Creek, there are also newly marked trails in this area; please stay on them. It makes life easier for the flowers and local property owners. 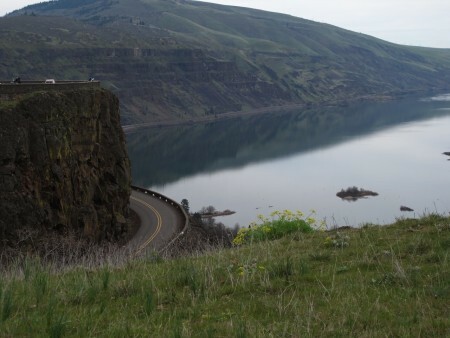 There are also terrific loops between here and Catherine Creek that are covered on Green Trails’ Esatern Columbia Gorge map. Ah, the glory of Dog Mountain. Start: The Gorge, Dog Mountain Trailhead. Distance: 7.2 miles. Elevation Gain: 2,900’. Take note: Almost no trailhead gets crowded like the Dog Mountain Trailhead. Try to go early and/or during the week. Peak flower time: Late May to early June. Final approach to the Dog Mountain summit. This is No. 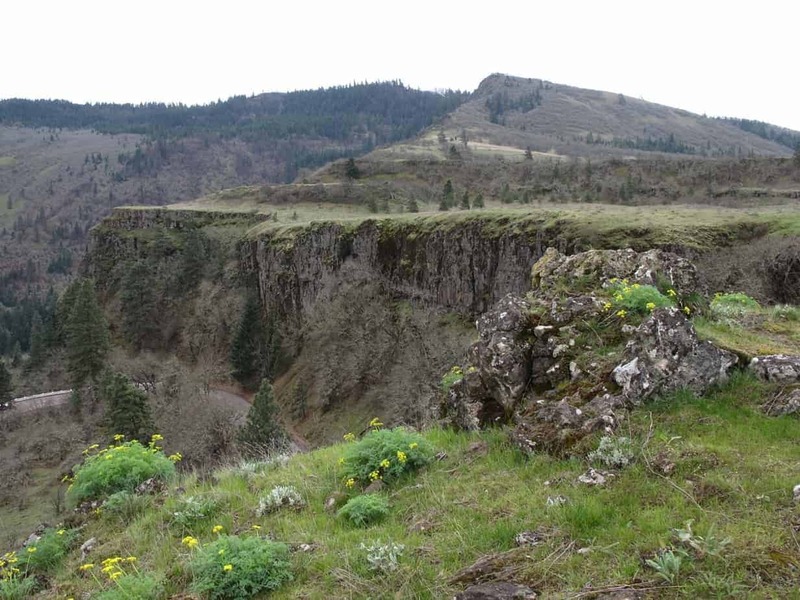 5 on my list of 10 ever-tougher conditioning hikes in the Gorge, which is to say: It ain’t easy. But it is oh so worth it. 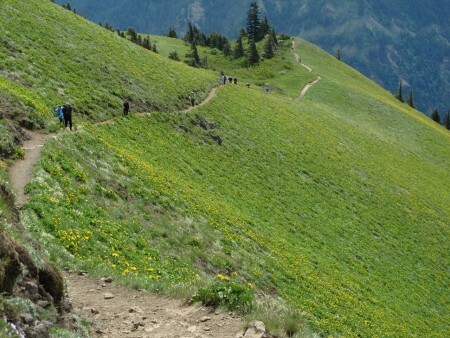 It’s listed as the last flower hike here because it’s the toughest and latest to peak, but the summit meadow here, when the flowers are out, is one of the prime destinations among all Portland-area hikes. It’s a long, steep hillside, 3,000 feet above the Columbia River, and it’s filled with flowers – mainly balsamroot, a small sunflower. There’s even a “sweet spot” in the calendar when the balsamroot is still out and the lupine, which comes later, is also blooming. Typically that’s about early June; this year probably more like late May. 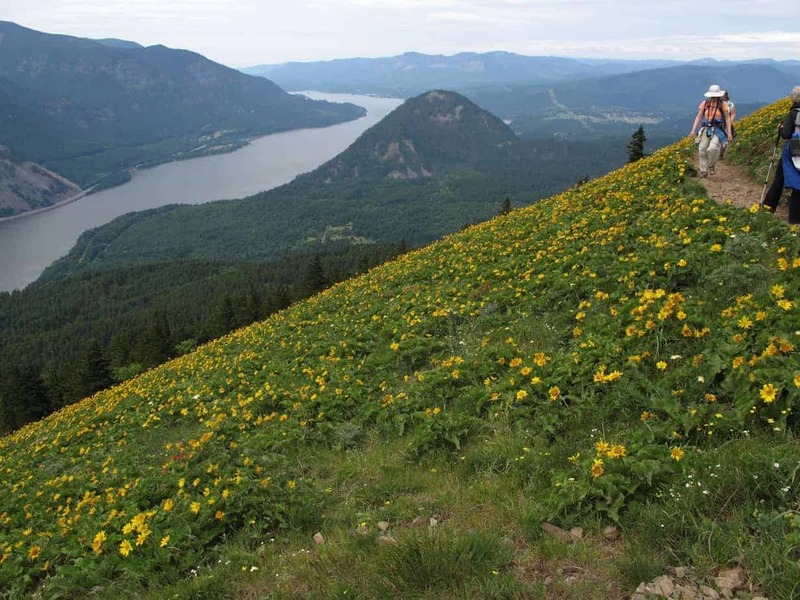 Update 2018: There is now a permit system in place at Dog Mountain on weekends until July. There are 165 available online plus an unlimited amount for people who take the shuttle from Stevenson. Get more info from the Forest Service here. There are also different opinions on which way to hike this mountain. There are three trails from two trailheads; my preference has always been to go left from the parking lot, up the Augsperger Trail, which is longer (hence less steep), shadier, and catches the westerly breeze in the morning. It also reveals the meadows a little more gradually, which I prefer. Then I go down the same way everybody else comes up – steeper, but you get it over with.